AIS goes mobile for more convenience aboard! Weatherdock WiFi products are a quantum jump regarding the simplification of data use aboard. With the built-in WiFi module, an additional navigation place is created on your boat. Received AIS data, and in addition, multiplexed NMEA data like GPS, wind, depth, speed, etc. from your boat are wirelessly linked to your mobile device. The latter can be a smartphone, tablet PC , iPhone or iPad. To visualize data on your mobile device, Weatherdock offers a free App named "easyAIS", which is available for download through the Apple store. In case you are running a mobile device with lower screen resolution, we still recommand to use a suitable plotter with appropriate resolution for your safety. The easyTRX2-IS-WiFi receives the incoming AIS data sent by commercial vessels (Class A) and pleasure boats (Class B). These telegrams are processed into a NMEA protocol which can be interpreted by chart plotters or PC software. With the wireless link to your mobile device, these data will promptly be received there as well. The integrated antenna splitter allows you to share the existing VHF aerial for both, the VHF radio communication and the AIS communication. The easyTRX2-IS-WiFi transmits according the AIS-Class B standard all own AIS data like ship name, speed and course over ground, etc. to every AIS receiver or transceiver within its radio range. Using the easyTRX2-IS-WiFi is the simpliest way to make yourself visible to others, having all necessary information about your surrounding too. Running the "easyAIS" App, you will see a radar screen appearing, showing all received AIS targets within range. A click on a target will prompt you detailed information to this specific target, such as ship’s name, speed and course over ground, etc. Additional information to your own boat’s navigational status like your own speed, course, wind, etc. are available through sub-menues of the App, if you feed the easyTRX2-IS-WiFi built-in multiplexer with boat information. The device comes with a USB-port. Data transfer to a connected PC/Notebook as well as controlling the device can easily be done by this port. The NMEA output data rate can be set to 38400 or 4800 Baud data rate. There is one NMEA input available with 4800 Baud data rate. This port allows you to connect additional NMEA data from your boat. These external data are then multiplexed and outputted at the NMEA output port. The unit’s actual status is displayed by 8 LEDs for your conveniance.. The built-in, independant CPA alarm algorithm immediately interprets incoming AIS data without a connected chart plotter. The built-in CPA alarm output allows you to easily connect an alarm device, like a horn, bell, or the easyCPA-alarm box, which is available at your dealer too. A separate pair of two cables in the wire harness allows you to activate the unit’s “Silent mode” and “PAN PAN mode” by attaching two switches to the cables. 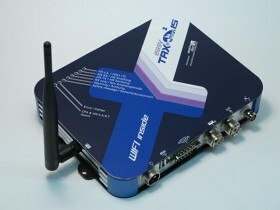 What is necessary to use the easyTRX2-IS_WiFi? Required is an own GPS antenna. To receive and transmit AIS, you can use an extra VHF aerial connected to the antenna input. Alternatively you can make use of the already installed VHF aerial, which you are using for VHF radio communication. In this case, connect the VHF antenna to the easyTRX2-IS-WiFi antenna socket. The VHF radio is simply connected to the VHF radio socket you will find at the front panel of the easyTRX2-IS-WiFi. As a third solution you can run the easyTRX2-IS-WiFi with Weatherdock’s VHF/GPS combi antenna. In that case you need not touching already installed antenna hardware at your boat. The mobile device has to have an installed AIS compatible software or App too. Which devices do fit to the easyTRX2-IS_WiFi? A PC/notebook is stringent necessary for configuration of your easyTRX2-IS-WiFi. If used for navigation, a navigational, AIS compatible software needs to be installed on your PC/notebook. Running a chartplotter or a WiFi compliant mobile device for navigation, a PC/notebook is of course not necessary. The operating system on your PC/notebook must be Windows XP SP2, Windows Vista or Windows 7. The screen resolution shouldn’t be less than 1024 x 768 at least. To transmit your own AIS data, a MMSI number must be programmed to the easyTRX2-IS-WiFi. The MMSI number can be programmed by yourself; alternatively ask your dealer to do it for you. Normally this MMSI number is equivalent to the MMSI number you are running with your VHF radio. If you are not yet registered with a MMSI number, please contact the national authorities to apply for a MMSI. Separate cables to switch on “silent mode” or “PAN PAN mode”. CPA alarm capability even with disconnected plotter. AIS SART Alarm capability even with disconnected plotter. Shared use of the CPA alarm sounder. SD Card Recorder for “BlackBox” use. for Linux or Mac use "windows emulation"